As an entrepreneur, hiring a new employee or picking up a virtual assistant is a great way to free up your time and allow you to focus on running your business. However, even though your VA may have the skills and requirements you’re looking for, you don’t want to jump headfirst into a project just yet. If you don’t take the time to properly train your new team member in your processes, preferences, and expectations, you’re probably going to find that you’re unhappy with their work. Before you begin delegating tasks, you want to ensure each new team member is properly trained. This means you’ll need to effectively communicate and document each step of the training process. Let’s take a look a few tips and tools you can use to help train your remote employees. When you’re training a new virtual assistant or outsourcer, you want to ensure you’re working as efficiently as possible. When both of you are itching to get started, there is no time to waste. To cut down on the amount of time you’re spending during training, find out the individual’s learning style and what you can do to make training easier. Be prepared to begin training with hearing instructions, written instructions, and charts, images, or videos. When you’re ready to go no matter what your new employee’s learning style is, you can hit the ground running and train more efficiently. Efficiently explaining how you complete a task can be a challenge. Even if it’s only a few simple steps, trying to walk your remote employee through the process can seem impossible. When you’re unable to sit down with your outsourcer and show them how to complete a project, you can turn to video and screencasting tools. Using a screencasting tool, such as Loom or Cloud App, can allow you to easily and effectively show your new employee how to complete a particular task. This kind of training is great for auditory and visual-spatial learners. Pro Tip: Keep your videos under 7 minutes whenever possible! While a video is a great way to show a new employee how to get something done, it isn’t the most efficient way to remind them of what you’re looking for. In order to provide your remote employee with a reference to ensure they’re completing things correctly, you want to create a checklist. There are a number of different tools out there that can help you create a process for each task or project, which can be particularly helpful for visual-linguistic learners, while also ensuring each piece of your project is completed on time. Trello and Asana are great tools to use, but you can also create a simple checklist in Google Docs or even just include it in the body of on an email you send. Sometimes it isn’t always necessary to take a full video. If there are only certain steps that may require some additional clarification, screenshots can make it easy for you to relay this information to your new remote worker. While many computers, smartphones, and tablets allow you to take screenshots without an app, certain tools can help you mark-up screenshots to point out details, make notes, or highlight suggestions. If you want to annotate your screenshots, give Skitch, Snag-It, or Cloud App a try. When working with any kind of remote employee, communication is key. However, staying in touch is even more important during the training process. Having an easy way to keep a conversation going can help you identify problems, ask questions, and give feedback to ensure you’re on the same page. Slack is a great way to message back and forth throughout the day, especially for quick questions and updates. If you’re looking for a video calling tool, however, Skype and Zoom both offer solid options. 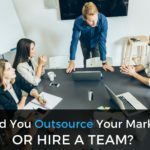 Outsourcing is the perfect way to streamline your workday and get more done without stretching yourself too thin. However, you need to stay realistic about your outsourcing needs. If you’re looking for lots of varying tasks to be offloaded, one full-time virtual assistant is unlikely to be an expert in everything. The decision to take on a new employee can always be a challenge. However, when you outsource the tasks and projects that are slowing you down and preventing you from working as efficiently as possible, you’re able to get more done in less time. Whenever you hire a virtual assistant or remote employee, you want to work with an individual highly skilled and experienced in the tasks you need. When you work with Automation Agency, you can rest assured you’re working with high-trained professionals capable of taking on whatever Design & Tech tasks you throw their way because you don’t get just one assistant but a team of experts. If you’re feeling overwhelmed by your workload or you’re constantly performing tasks you don’t enjoy, take our Right Fit Quiz to see if Automation Agency is the right solution for ousourcing some of your marketing tasks.